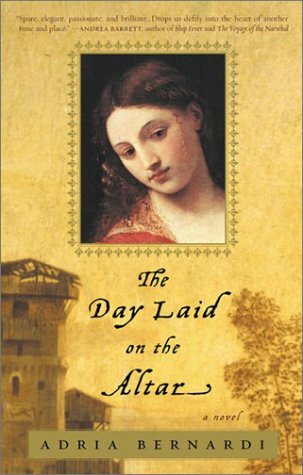 Set against the backdrop of sixteenth-century Italy, The Day Laid on the Altar re-creates a rich, vibrant world of art and beauty, in a tale that sweeps from a remote mountain village in the Tuscan hillside to Venice, where the master painter Titian grapples with the demands of fame and family while the plague is devastating Italy. Interweaving the lives of humble peasants and unsung artisans with celebrated painters and patrons, The Day Laid on the Altar is a powerful meditation on the meaning of art, the mystery of creation, the fervor of religion, and of lives-great and small-touched by genius. It is a luminous, seamlessly written first novel by an author of prodigious literary gifts. About Adria Bernardi (Author) : Adria Bernardi is a published author. Published credits of Adria Bernardi include The Day Laid on the Altar.